We list and link EVERY lodging provider in Treasure Island that we know of. Like this page ?? Visit Beachdirectory.Com for even more detailed information about Treasure Island. 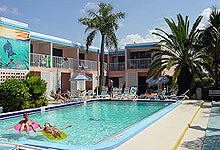 The Arvilla is located directly on the Gulf of Mexico and is family owned & operated. Our extensive web site shows the inside of our units. Motel rooms, efficiencies and apartments from $59 to $153, depending on the type of unit and the time of year. Discounts for weekly or longer stays. Immaculate rooms and friendly atmosphere! Affordable accommodations - great value! 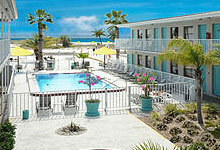 Clean, comfortable and affordable, directly across the street from the beach on the Gulf of Mexico. Telephone and microwave in each unit. Full description of each of our 14 units on our website, and lots of pictures. Motel rooms, fully equipped efficiencies & 2-BR apartments. All units face the Gulf of Mexico ! In-unit jacuzzi bathtubs, hot tub, heated pool and all that you would expect from a great resort. FDA Management is the exclusive rental agent for Jamaican on the Gulf, as well as several other nearby Gulf Coast properties such as Commodore Beach Club in Madeira Beach and Hideaway Sands in St. Pete Beach. See our site for complete details. Located directly on a wide and beautiful white sandy beach, we are affordable and comfortable. Suites, efficiencies and motel rooms. We pride ourselves on being "the Suncoast´s friendliest resort". 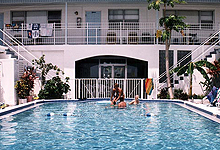 We have a beautiful 42-unit property with a lovely pool - see pictures of our resort on our website. Enjoy our private boat and fishing dock. Enjoy relaxing times with us while being just across the street from the clear blue waters of the Gulf of Mexico and directly on the intracoastal waterway. We offer many conveniences to complement your stay with us, including barbecue grills, shuffleboard, a large heated pool, private patios, and a coin laundry are all on the premises. You will enjoy our tastefully furnished one bedroom apartments and efficiencies, each equipped with color TV, in room telephones, and individual air conditioning/heating. AAA-rated - 2 diamonds! Directly on beach. Our palm-studded, white sand beach and tropical landscape provides a relaxing and beautiful backdrop for your enjoyment of friendly, informal holiday living at its best. We offer 22 guest rooms, one-room studios and large apartments. 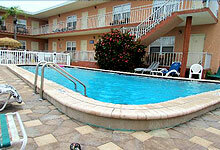 Large pool, pictures of all of our units on our website. Owner-operated. We have a place to stay suitable for everybody´s needs: fully equipped suites, apartments, comfortable efficiences and regular motel rooms. Enjoyment for all ages: a large heated pool, pool-side lounge chairs, shuffle-board courts and more. Or step straight out onto the beach and walk for miles. Motel rooms, efficiencies and apartments from $45 per night !! Attractive units and low rates make us a favorite with our guests who return year after year. 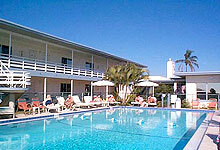 Heated pool, cable TV and phones in every room, guest laundry and barbecue gas grill for your enjoyment. Certified as a Superior Small Lodging and rated in Mobil Travel Guide. Where else can you get a great motel room for just $45 per night! Enjoy our heated pool and Kids Pool and beachfront sundeck overlooking the beautiful & relaxing Gulf of Mexico. Do some sunset-watching! We offer non-smoking motel rooms, efficiencies, suites and 1 & 2 BR apartments. Our property is directly on the beach. We also offer Pet friendly Bayside One Bedroom apartments on Boca Ciega Bay for fishing and boating. Extended stay rates available. The Thunderbird offers a Classic Courtyard style with Poolside and Gulf-front rooms and efficiencies. Private Gulffront Balconies, Oversized heated pool and hot tub. Ikki Woo Woo’s Tiki Beach Bar with Live Entertainment most days. Tiki Café is on site for breakfast and Lunch. Weekly and extended rates available. We have more rental units than anybody else on the Tampa Bay Beaches and offer a Total Concept for all of your vacation needs. Whether directly on the beach, or across the street, we have it all ! Some examples of our properties: Vistas on the Gulf, Gulf Strand Resort, Sea Breeze, Madeira Norte and many more. See our website for full details. Our contemporary 25-room bayfront hotel is located in beautiful Treasure Island, FL just minutes from Saint Petersburg and Tampa. Guest rooms have been completely remodeled in 2009. Boat slips are available for quick and easy access to the Gulf of Mexico, and the beach is directly across the street. The Bilmar Beach Resort offers unparalleled sophistication and elegance that you won't find in ordinary hotels. The Bilmar has been the undisputed favorite of families for years. The spacious studios, efficiencies, penthouses, suites, studios and amenities that include two heated pools and a beachside fitness trail are all a part of what makes this oceanfront getaway unforgettable. ALL rooms are Non-smoking. We offer the atmosphere of a tropical resort getaway while still being near all of the attractions located in the Tampa Bay area at very affordable prices. Internet, weekly & monthly specials ! 3 blocks to John's Pass. Our recently renovated family run BUNGALOWS consists of studios or bungalow apartments - each with a fully equipped kitchen. Enjoy our new pool, BBQ area, shuffleboard and other guests. Boat ramp is just one block away. The only thing better than BUNGALOWS is our GUESTS! 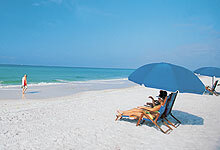 Florida vacation rentals - that's what we know best, that's what we do best! Each year Capalbo Rental and Management makes dreams come true for tens of thousands of guests whose plans call for travel to Florida and our Gulf of Mexico beaches. The Crystal Palms Beach Resort is a new 36-unit boutique hotel, equipped to serve the business or leisure traveler with all of the comforts of home. All of our luxurious suites feature full kitchens with granite countertops, 42 inch flat screen high definition TV's in the living room, private balconies facing Treasure Island Beach and the Gulf of Mexico.. Choose from One Bedroom Suites (over 800 sq ft) or two Bedroom Suites with over 925 square feet of living space. Also: 3 bedroom Roof Top Penthouse Suites featuring a master bedroom Jacuzzi, balconies overlooking the Gulf beach and over 1,850 square feet of living space! Welcome to Gulf Sounds...the "Treasure" on Treasure Island, conveniently located on the beach side of Gulf Blvd., less than a mile from John's Pass. We offer Key West style, private and well appointed 2 bedroom cottages and efficiencies, a covered BBQ area, rooftop sundeck and an easy, short 30 yard stroll to the wonderful white sandy beaches of the Gulf of Mexico. Visit our website for panoramic pictures or call us for specials. Gulf-front efficiencies from $535 per week !! 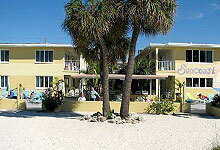 Located directly on the beach in the quiet southern part of Treasure Island (T.I. ), yet within walking distance to shops and restaurants. Large units, see our floor-plans. Many guests return every year! 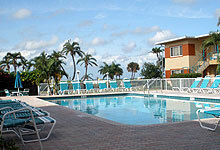 We have a large pool, fully equipped clean units, and great prices. Private Balconies Overlooking the Gulf of Mexico! 101 units in a prime location directly on the beach. Relax as you watch parasailing or sailboats gliding by, or the windsurfers being chased by a warm, tropical island breeze. Relax by the pool, or enjoy a walk on the uncrowded beach. Book directly on-line, or call our 800-number. Non-smoking units available. Also certified as a Superior Small Lodging. Gulf-front apartments with a fantastic view that you must see (picture on our site). 14 fully equipped units, from $322/week. Proudly family-owned and operated, we offer great value and a relaxed atmosphere. Located directly on the Gulf of Mexico, direct beach access, great fishing spot, 3 min walk to restaurants, shops, famous bars, parasailing, jet skiing and more! Offering 1 and 2-BR apartments, efficiencies and motel rooms. Under NEW Ownership since January 2016! Call for details. 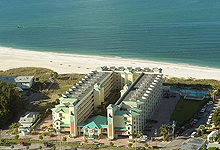 Several resort properties along the Gulf Beaches . . .
Liberte Management Group offers several resort-styled communities along the Gulf Coast. These include Sunrise and Caprice in St. Pete Beach, Voyager in Treasure Island, All Seasons in Madeira Beach and Nautical Watch in Belleair Beach. See our extensive web site for more details. The Lorelei Resort Motel is located on beautiful Treasure Island in Florida, only minutes from the St. Petersburg - Tampa Bay area. Our waterfront property is specifically designed to be pet friendly. Dogs are always welcome here! Efficiency and 1-BR apartments with kitchens, centrally located on Treasure Island Causeway, 2 blocks from the beach, shopping and restaurants. Your Relaxation Destination in a tropical setting offering daily, weekly and monthly rentals where you will see the same guests return year after year. 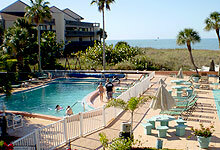 You can swin, play horseshoes and shuffleboard, or just kick back and watch the dolphins and manatees play in the bay. Our clean 10-room mote is family owned and operated. 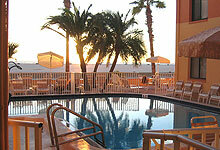 We offer clean budget accommodations, we are AAA-approved and we have a heated pool. Every room has a refrigerator, coffeemaker and a 32" Plasma TV. Pool-side barbecue and free WiFi for guest use. Kids under 12 stay free. Our motel is on major bus route for your convenience. See all our great reviews on Tripadvisor. The Molloy is the perfect Florida experience. 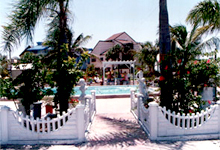 This family owned and operated resort is located directly on the Gulf of Mexico in beautiful Treasure Island, and offers hospitality seldom found anymore. The Molloy offers homelike accommodations overlooking the pool and beach, and all provide a living room and private bedroom. Completely equipped kitchens allow you to enjoy early morning coffee and prepare a meal, if you'd like. Step onto our Treasure Island beach resort and discover a Nordic masterpiece. The finest in interval ownership resorts, Nordvind reflects the unsurpassed quality and craftsmanship the Swedish take pride in. Exclusive Scandinavian details, from imported oak cabinetry to the intricate ceramic tile throughout. Strong and elegant, the glass sculptured resort offers a majestic view from every suite. Experience Nordvind's beauty, comfort and style as you take pride in owning your world class condominium. Enjoy your adventure in the land of long ships and white sands. At the Penthouse Beach Club all of our units are Gulf-front with a homey touch we know you will love. We offer the following features, weekly maid service, barbeque grills, eight floor club house facilities, private beach front, individual Gulf-view balconies, heated swimming pool and more. Pieces of Eight was built in 1948 and lovingly restored and decorated room-by-room in 2004. The location is as convenient as a vacation getaway gets. It is situated on the North end of Treasure Island, just a few short blocks from the world-famous Johns Pass Village and Boardwalk, featuring many fine restaurants, shops, fishing charters, and cruises. Located in the Tampa Bay area of Florida, Treasure Island has one of the most beautiful beaches on the west coast of the Sunshine State. Riotel is just a few short steps from the Gulf of Mexico where the emerald water and white sand will relax your body and mind. Family-owned since 1975. Motel rooms, efficiencies and 1 & 2 bedroom apartments. 3-night minimum. 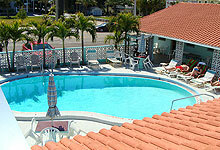 Heated freshwater pool, located directly on the water, fishing dock, picnic facilities and shuffleboard courts. An atmosphere for a memorable vacation - see why we have so many return guests. Wir Sprechen auch Deutsch! Our quaint cottages provide fully equipped kitchens, cable TV, individually controlled A/C and spectacular views of the beach and the beautiful Gulf of Mexico. Seahorse Cottages is conveniently located close to shopping, local points of interest, and all of Central Florida's major attractions. Located in a quiet, primarily residential neighborhood, Sunset Beach House is one uniquely designed house split into 5 suites. Each suite is furnished with the style and features to suite anyone's needs. There are three smaller one-bedroom efficiencies called the "Beach Hugger Suites" and at the west end of the building is a portion of the house that towers 5 levels high. Imagine the views! There are two deluxe suites that are each 2 and a half floors. The "Sandpiper Suite" is on the bottom level, and the "Tree House Suite" is on the top. The architecture of the Beach House is indeed, quite extra-ordinary. Exclusive property directly on the beach ! 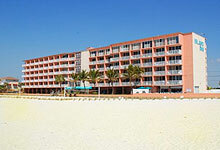 Located directly on the beautiful Gulf of Mexico. White sandy beaches with breathtaking views from your deck or tropical patio. Private get-a-way in a beach guest house with only four rental units. Situated among private homes and small hotels with a tranquil and tropical setting. Our large one bedroom unit offers a fully equipped kitchen, fireplace, whirlpool bathtub, indoor grill and private deck for dining or dolphin watching. Separate bedroom with added loft for additional guests. 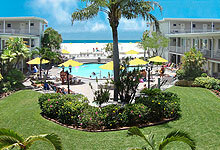 The Surf Beach Resort offers an exciting opportunity to experience life on the beach. 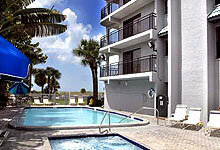 Located in sunny Treasure Island, Florida, the Surf Beach Resort is a hotel/condominium that provides patrons the opportunity to escape from it all by renting a beachfront suite. The Sands Motel is a beautiful tropical beach resort with white, sandy beaches and the blue waters of the gulf of Mexico in Treasure Island. Perfect for a weekend escape or an extended vacation. 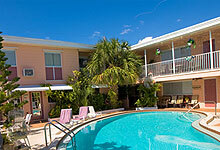 Luxurious comfort with tasteful decor is yours to enjoy at the Trade Winds Motel. Clean rooms combined with a decorative touch will give you the rest and relaxation you look for in a Florida vacation. Wherever your journey begins, Trails End Resort Motel is a destination sure to please. Experience casual Florida living in a tropical atmosphere right on one of the most beautiful beaches in Florida. Our one- and two-story buildings provide fabulous views of the Gulf of Mexico in an intimate, comfortable setting. 1 bedroom & 2 bedroom apartments available ! Apartments overlooking the Gulf from $370/week ! One block from world famous John's Pass Village, our apartments have fully equipped kitchens with microwaves. Walk to the beach, no busy streets to cross. See floor plans on our site. Cozy, family-run property with just 11 units. Your hosts: Sylvia & Paul. Interval ownership property with 2397 owners. Set on a popular vacation isle overlooking the Gulf of Mexico, this resort is close to family attractions such as Tampa's Busch Gardens. All water sports can be enjoyed in the area, known for its fine beaches. At Whispers, the ever-present breezes gently blow over the island and take your cares away. You will revitalize and energize your body, mind and spirit. This very unique hideaway oozes charm, serenity and character. Whispers nestles on the calm waters on the leeward (sheltered) side of Treasure Island right in the Gulf of Mexico. Dolphins swim past our dock through "Dolphin Alley." Dazzling, sunny days can be spent in peace and renewal of body and soul.